A three-quarter length portrait of two men holding clubs, one wearing a long feather from a headband. They have evidently just broken off from a conversation together outside Evans-Pritchard's tent as he photographs them. The location is described as western Nuerland, probably either Nyueny village among the Karlual section of the Leek tribe or Jikul, which is lineage or clan name not associated with one tribal territory, but which was a significant lineage around Nyueny and surrounding villages in Leek country, but also elsewhere such as Western Jikany. Note on print reverse ms pencil - "3 W. Nuer" & print front border ms ink - "NUER II/82"
Morton, Chris. 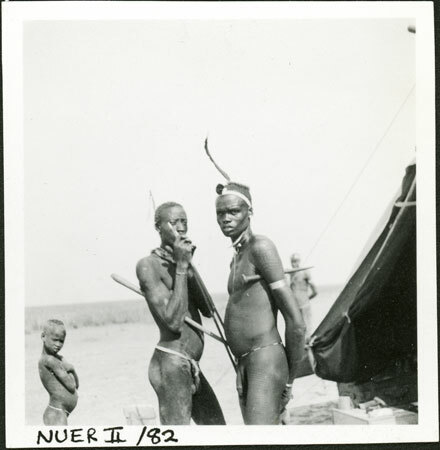 "Portrait of Nuer men" Southern Sudan Project (in development). 03 Jan. 2006. Pitt Rivers Museum. <http://southernsudan.prm.ox.ac.uk/details/1998.355.90.2/>.